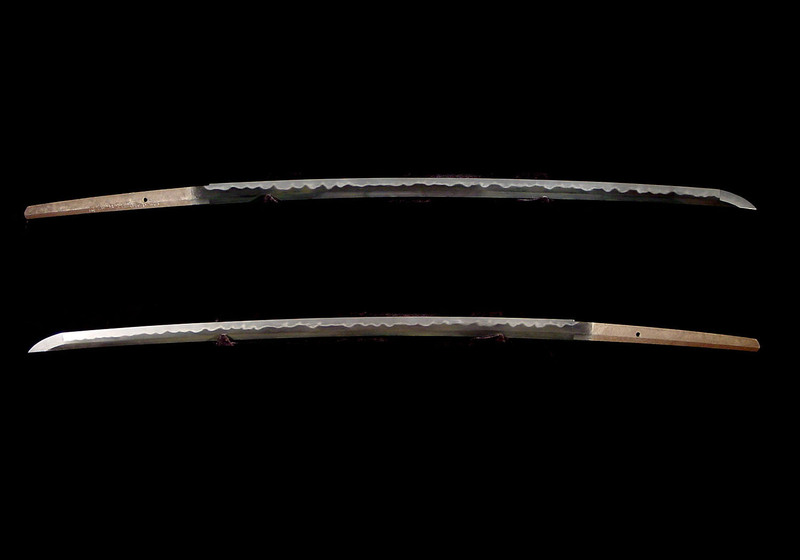 This is a very interesting and rare katana by the Shinshintô smith, Yoshinobu. Yoshinobu was a smith from Shinano province who worked around the Genji era (1864-1865). He studied in the Saneo mon. Saneo the older brother of the most famous Shinshintô smith, Yamaura Kiyomaro. 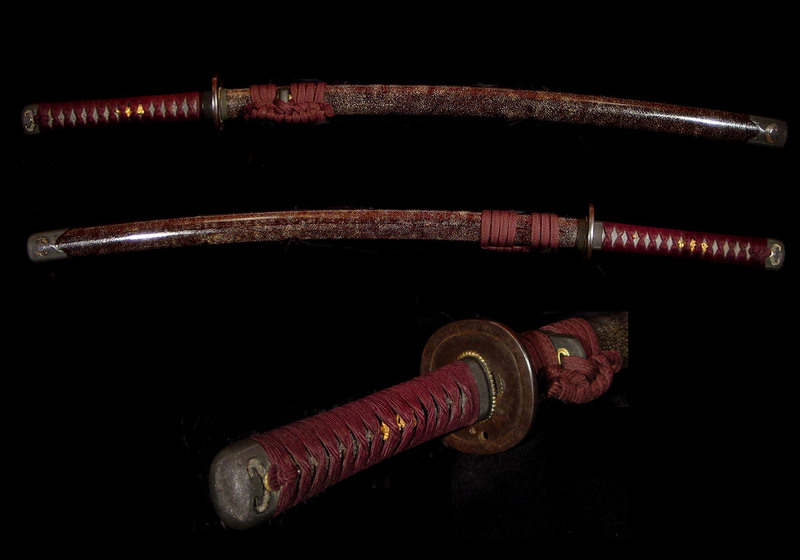 This sword definitely shows the traits of the Kiyomaro school as they were passed down through Saneo. 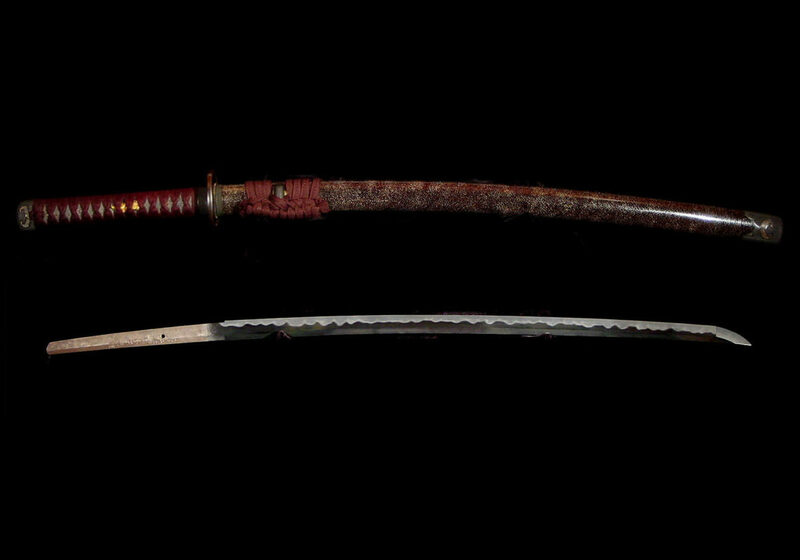 It is a robust katana measuring 27 9/16 inches or 70 cm in length. 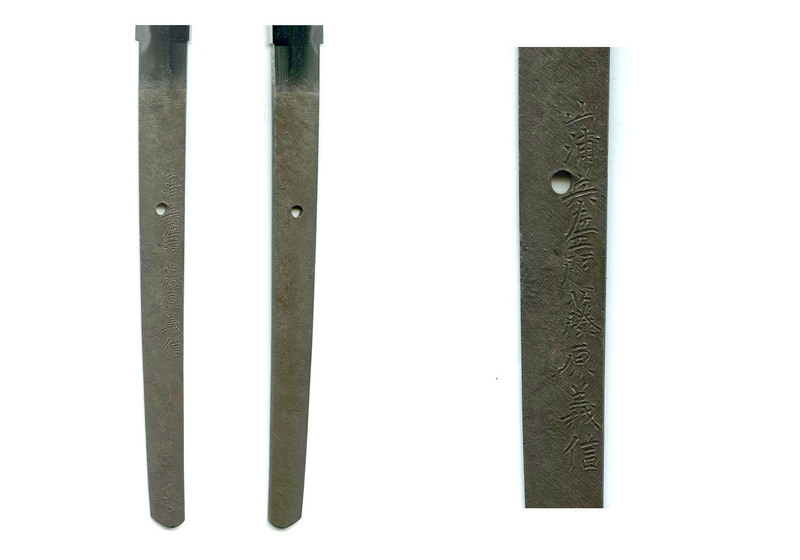 The moto-haba is 1.12 inches or 2.85 cm and the saki-haha is 0.9 inches or 2.28 cm. 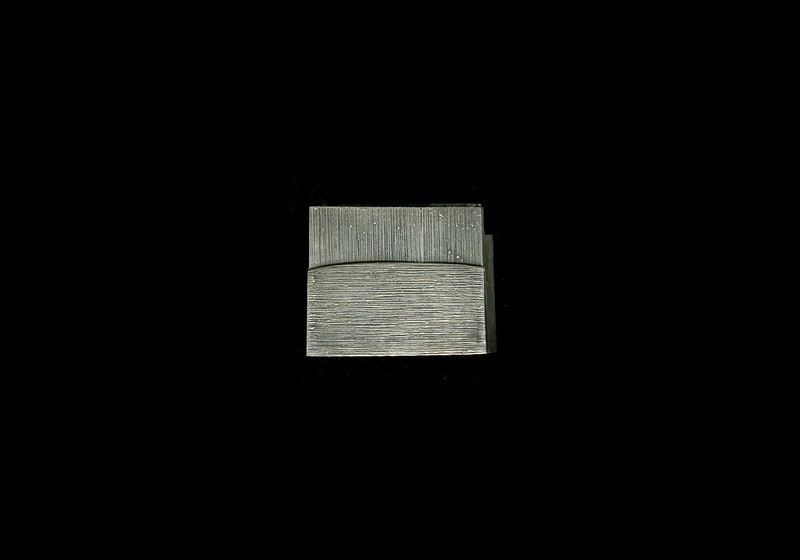 The jigane is a beautifully forged ko-itame with areas of ko-mokume. There is abundant ji-nie sprinkled throughout the ji and there are areas of ara-nie floating in and just above the habuchi. 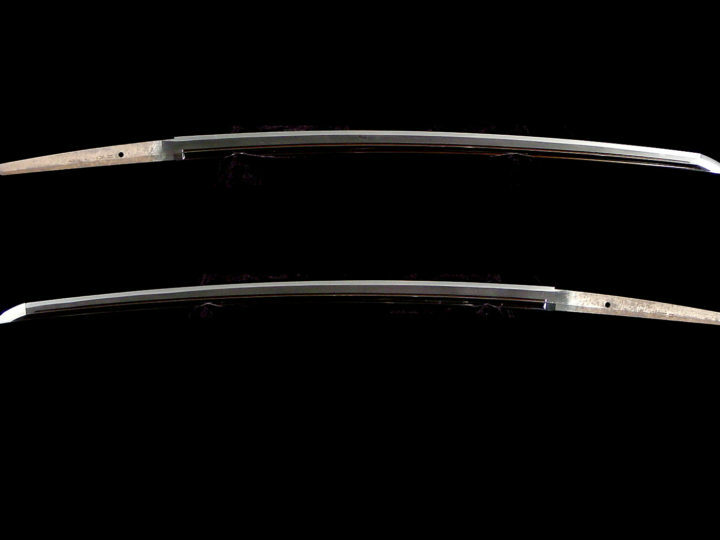 The hamon is a very active notare-midare mixed with areas of gunome-midare. There are large areas of sunagashi and kinsuji forming what appears to be areas of niju-ba all along the hamon. This is a very active hamon that will give hours of viewing pleasure with new discoveries to be found at every turn. 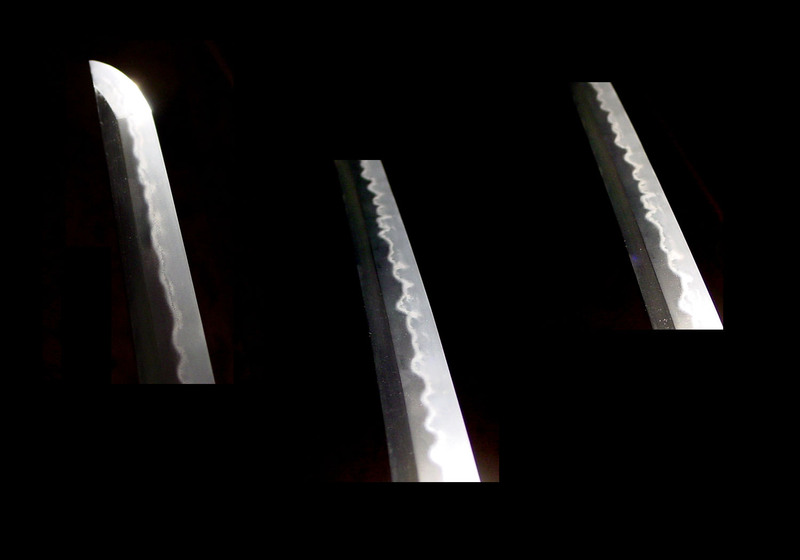 The bôshi is a stretched chu-kissaki that adds a feeling of power to this blade. 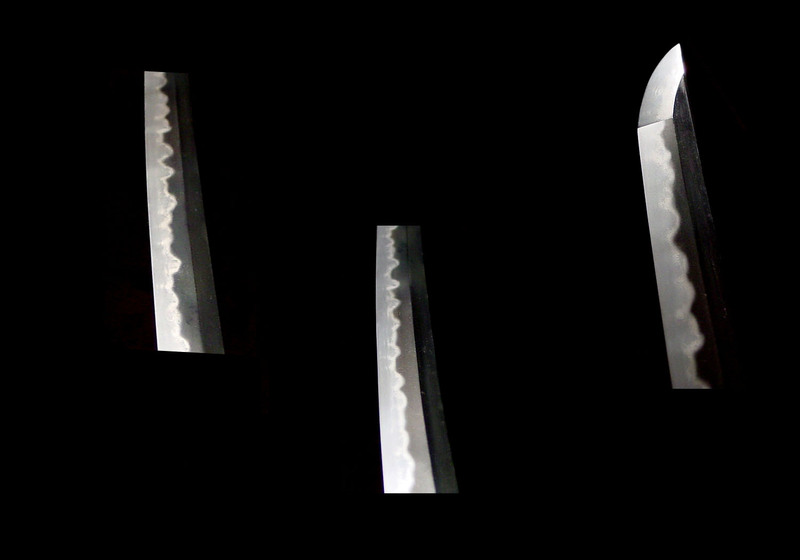 The hamon continues into the boshi in a midare pattern that develops areas of hakkikake and ends in a ko-maru shape with a short kaeri. Everything about this blade exudes strength and beauty. 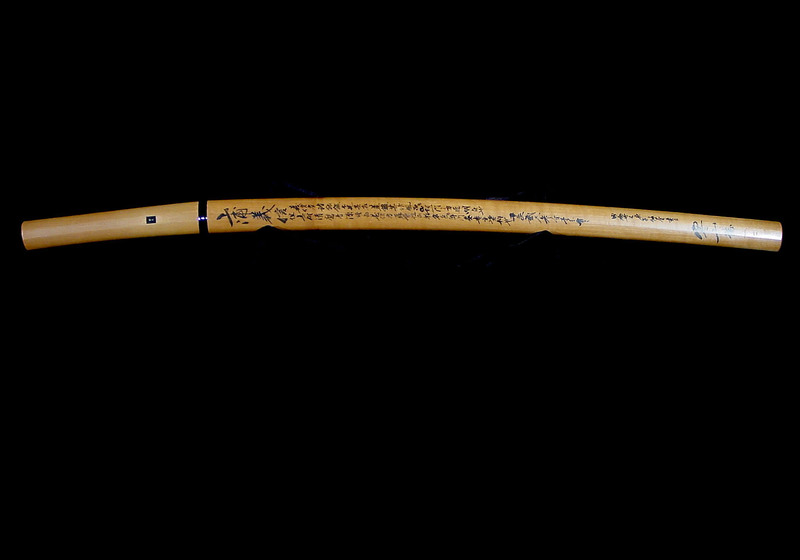 The nakago is ubu with the naga-mei that reads, Yamaura Hyôzaemon Fujiwara Yoshinobu (山浦兵左エ門藤原義信). It is extremely interesting that at the time Dr. Sato wrote the sayagaki, this smith was not referenced in the Nihontô Meikan. Subsequent to Dr. Sato’s passing in 1978, this smith was added to the Meikan as more details of his life became known. The Meikan clearly states of his ties to the smith, Yamaura Saneo and, of course, Kiyomaro. 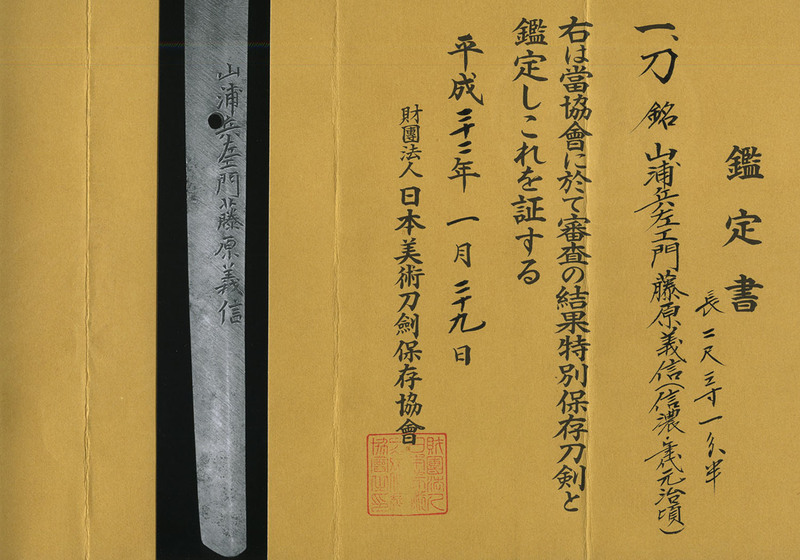 This blade was awarded NBTHK Tokubetsu Hozon papers in 2010. verifying the validity of the signature and the quality of the blade. 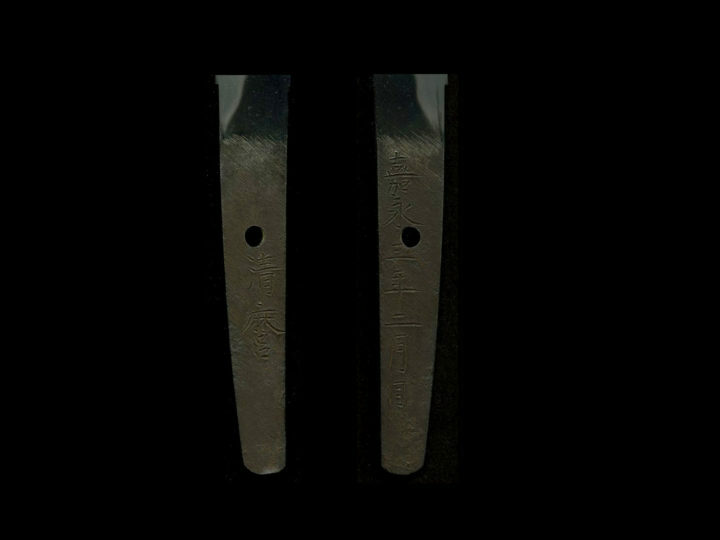 Even more impressive is the fact that Dr. Sato wrote of the quality of this blade at a time before the smith’s history was well known as it is today. This blade is accompanied by an outstanding set of koshirae that is, in all probability, original to the blade. The photos of this koshirae do not do it justice. The saya is a same-zaya of the highest quality. It has a slightly brownish tint to the same that was overemphasized by the lighting when I took the photos. What is really interesting about this saya is the fact that the upper portion of the side that rests next to the wearer’s body has been flattened to create additional comfort when the sword was worn, especially if it was worn while the Samurai was on horseback. 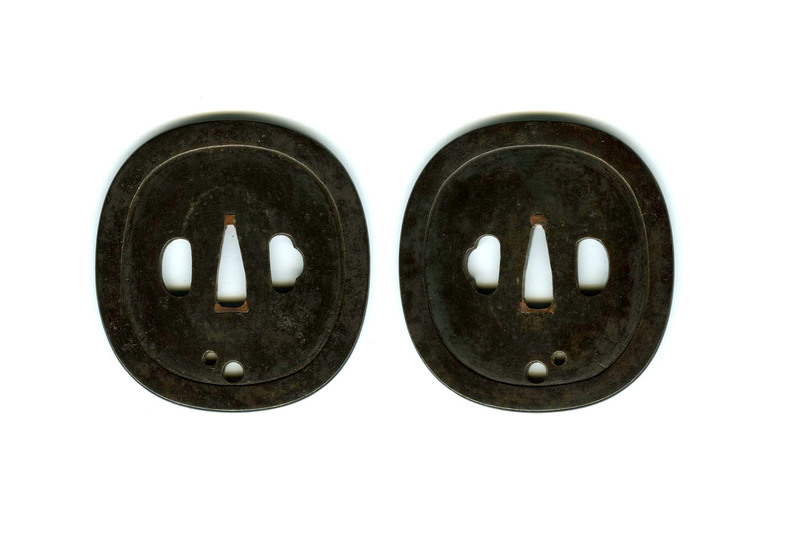 The tsuba is a massive and heavy solid iron tsuba with a wide, slightly raised edge. It is not signed. The menuki are of dragons and I strongly suspect that they are made of solid gold and they are exquisitely carved. The balance of the fittings are all matching. They are all of massive size and comprised of solid shakudo nanako of superb quality. 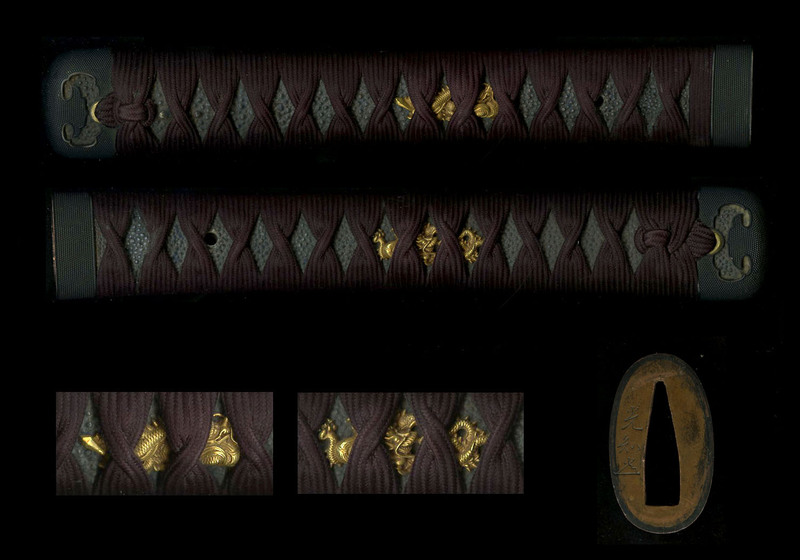 The fuchi is signed Mitsukazu (kao). There was an artist by this name work worked in the middle of the 19th century. His family name was Mizuno and he succeeded to the title of the seventh master of the Mizuno school in 1838. He worked for the Maeda family in Kanazawa of Kaga province. He died in 1866 at the age of 66.